Bob additionally scanned over 1,000 separate "race" reports as jpg images. However, these were not indexed or have complete file names, except as they are stored in particular folders (directories) for each race venue. They are not included in the digital library, but are in a separate folder described below. The periodicals were scanned to PDF "image" files and cannot be searched for text. These can be converted by OCR software, but this would be a long and tedious project. However there is a text index to all of the MotoRacing periodicals, which can be searched for names and other terms. Race Programs, loaned by Bill Pollack were also scanned, but not every page. These are PDF "text" files, fully searchable. The completed Greenstone library is just over 5 GB (too large for a DVD); it easily fits on a 8 or 16 GB USB drive. Using a 16 GB drive, the Sports Car Library was transferred in two versions - a Greenstone digital library, indexed by title, date and description. This self-running library only runs on a Windows PC. For Mac users, there is a second version on the 16 GB USB drive, all of the periodicals in separate folders under the main "The Norton Scan Project" folder. The "MotoRacing" folder also contains the separate race results images in the "MotoRacing-Results" folder. Open the "The Norton Scan Project" folder. Further open any folder with the periodical title you want to check, such as "CompetitionPress" or "SCCA National Newsletter". Browse through the volume folders and select any individual issue to open. As described above, individual race results are in the "MotoRacing" folder as is the index to these periodicals. All of the periodicals have been re-labeled since originally scanned by Bob Norton with more descriptive titles, such as "CP-Vol01-02.pdf". Originally, their titles only made sense as the belonged to a specific folder, much like the individual race results images. Browse "The Norton Scan Project" folder as described above. When the USB drive loads and presents choices, select "Open folder to view files using Windows Explorer". Then click on "server.exe", which has a globe icon. The first time the Library loads, a file named "llssite.cfg" will be created to "point" the library to the location of its files for faster loading on next use. If you switch between PCs, this may point to the wrong location and result in an error message. If so, delete the "llssite.cfg" file and click "server.exe" again. 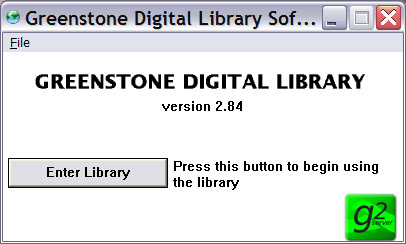 A small Greenstone menu will appear; select "Enter Library". The browser will open on the main menu. Click on "Sports Car Library" image (to the left) to enter the main library. The middle image, "Digital Library Project" will open the web pages that explain the entire digital car library project. The right image, "The Fabulous Fifties" will open a collection of this group's newsletters from 2004 through 2011. After choosing "Title, Date or Description", a "bookshelf" listing will appear to show how many volumes or items are contained in it. Click the bookshelf icon to the left. Click again on the icons to the left to further drill down to individual periodicals and click on the Acrobat icon to the left of the periodical to open it. Indexing may be improved in the future!